Summary: A copy of the Will of Philip Stedman of The Razees, Bosbury dated 30th April 1819 listing his bequests to his nephew, Philip Stedman Sparkman, and other family members. His good friends, Richard Heming and James Holbrook, are appointed as executors. The document is held at The National Archives at Kew, London, reference PROB 11/1656. Philip Stedman died and was buried in Bosbury Holy Trinity churchyard on 1st December 1820 aged 76. Considering the certainty of death and the uncertainty of the time thereof, I, Philip Stedman of the Razees in the parish of Bosbury in the county of Hereford, Esquire, do make, publish and declare this to be my last will and testament in manner following, that is to say. First I direct that my just debts, funeral expenses, the charges of proving this my will be paid by my Executors and Trustees hereinafter named and appointed by and out of my Real and personal Estate in manner hereinafter mentioned. 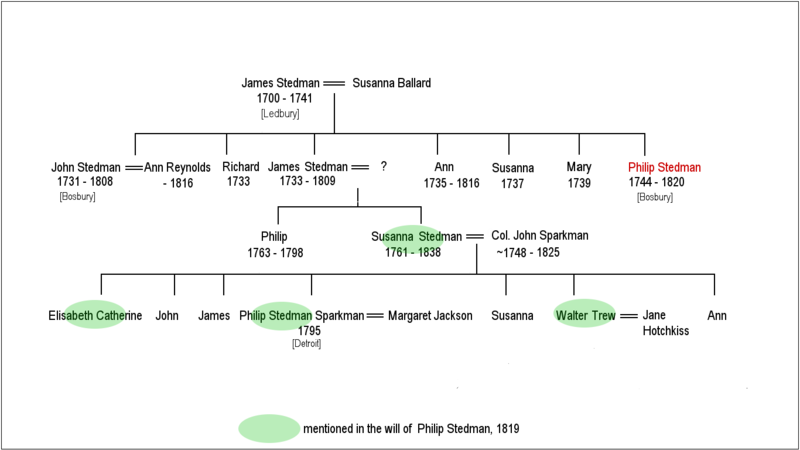 Also I give devise and bequeath unto my nephew, Philip Stedman Sparkman, now residing with me, all that my estate Lands and hereditaments as well Freehold, Copyhold and Leasehold called the Nashend, situate in the said parish of Bosbury, as the same is now in the occupation of my Tenant, Robert Drew, together with the tenements thereto belonging now or late in the occupation of Joseph Hickup, George Syde, John Field and William Jones and also all the Coppice Woodland belonging to the said Estate now in my own occupation to hold to him my said Nephew, his heirs and assigns for Ever or according to the nature of my Estate and Interest therein respectively. Subject nevertheless and I do hereby expressly charge the said Estate Lands and Hereditaments in the hands of my said Nephew with the payment of one annuity or yearly sum of twenty five pounds which I do hereby give and bequeath unto Mrs Mary Edwards of Bosbury, widow, for and during the term of her natural life and to be paid by four quarterly payments the first of such payments to begin and be made at the end of three months next after my decease and, in case of non-payment of the said annuity in manner aforesaid, I do declare that it shall be lawful for the said Mary Edwards and her assigns to levy seize and distrain for and recover the same with all Costs and expenses as in case of non-payment of Rent. And as for all the Rest and Residue of my Freehold, Leasehold and Copyhold Estates, Farms, Lands, Hereditaments and Premises situate lying and being in the parish of Bosbury and Manors of Bosbury, Colwall and Coddington in the county of Hereford and also all other my Real Estate wheresoever situate l ying or being and likewise all and singular my monies, securities for money and all my Live and dead Stock, Implements of husbandry, Casks, household goods of every sort and kind and in general all my personal Estate and effects of every denomination and wheresoever situate lying being and over which I shall at the time of my death have any disposing power, I give devise and bequeath the same and every part and parcel thereof and all my Estate and Interest therein unto my good friends Richard Heming of Kingsland in the county of Hereford, Gentleman, and James Holbrook of Ledbury in the county of Hereford, Gentleman, to hold to them the said Richard Heming and James Holbrook and the survivor of them and the heirs, executors, administrators and assigns of the survivor of them according to the nature of my said respective Estates upon Trust that they, the said Richard Heming and James Holbrook or the survivor of them or the heirs, executors or administrators of such Survivor, do or both and shal,l as such as conveniently may be after my decease, sell and dispose of all and singular my said Real and Personal Estate and Effects and every part thereof either by public auction or private sale together or in such Lot or Lots as they or he in their or his direction shall think fit or just proper and call in and receive all debts and sums of money due and owing to me at the time of my death and by and out of the monies to be so received or which may arise from the Sale or Sales aforesaid do and shall pay, satisfy and discharge all my debts funeral expenses the charges of proving my will and all incidental expenses and also all my Bond, Debts, Mortgages and other encumbrances affecting my said Estate so given to them for the purposes of Sale or affecting my said Estate hereinbefore given to the said Philip Stedman Sparkman it being my intention that the said Philip Stedman Sparkman shall hold and enjoy the said Estate Subject to the said annuity free from all encumbrances except the Landtax annual reserves, Rents, fines, heriots and Chief rents which are and have been usually due or payable for the same and also do and shall by and out of the monies to arise by and from the Sales aforesaid pay and discharge the Legacies and bequests next hereinafter mentioned, that is to say, I give and bequeath unto my Brother’s Godson, Charles Holbrook, Lieutenant in the Royal Navy, the sum of one hundred pounds of lawful British money for his own use and benefit. Also I give and bequeath unto my Goddaughter, Frances Maria Holbrook of Ledbury, the sum of one hundred pounds of like money for her own use and benefit. Also I give and bequeath unto the said Richard Heming and James Holbrook the sum of one hundred pounds apiece of like money for their own use and benefit. Also I give and bequeath unto William Ballard of Worcester, tailor, one hundred pounds of like money for his own use and benefit, all which said Legacies I do direct shall be considered as vested Legacies from the day of my death but shall not be paid until the whole of my personal Estate hereinbefore directed to be sold shall be sold and disposed of and the purchase and respective purchase monies and all other monies due and owing to me at my decease shall be wholly received by my said Trustees. In witness whereof And as to all the rest and residue of the monies to arise from the sale of my said Real and personal Estate and Effects, I give devise and bequeath the same unto my said Trustees and the Survivor of them and the Executors and administrators of such Survivor upon Trust to place out at Interest upon Government or some other Security or Securities and from time to time to call in and replace the same or some new or other security or securities as often as he or they shall see occasion or think right and as and when the interest thereof shall from time to time be received do and shall pay the same unto my niece, Susannah Sparkman, now residing in North America for and during the term of her natural life distinct and apart from her present or any future husband and with which he shall have nothing to do and her receipt alone shall be the only good and sufficient discharge for the same and, from and after her decease, I give and bequeath the principal of such residuary monies and the unapplied interest thereof if any unto and equally between Walter and Elizabeth Sparkman son and daughter of my said niece the said Susannah Sparkman to and for his and her own use and benefit for ever. And it is my will and I do hereby order and direct that the devise hereinbefore made of the Nashend Estate to the said Philip Stedman Sparkman and the bequest of the Residuary estate and monies to my said Niece, Susannah Sparkman, for her life and afterwards to her Children is made upon this condition that they, the said Philip Stedman Sparkman and his Mother and Father and the said Walter and Elizabeth, or such of them my said Trustees or their Counsel shall think requisite, do and shall join in and execute and do and perform all and every act and acts, deeds, surrenders, releases and conveyances which may be thought necessary and requisite by my said Trustees or their Counsel for making and perfecting the several Titles to the several and respective Estates, lands and hereditaments which I have at any time heretofore sold or may hereafter during my life sell or which by this my will are directed to be sold by my said Trustees. And in case of his her or their refusal so to do, then I do hereby revoke the bequest hereinbefore made of the said Estate called the Nashend with the Cottages, Lands and Premises to the said Philip Stedman Sparkman his heirs and assigns and I do hereby also revoke and make void the bequest of my residuary monies and the interest thereof to the said Susannah Sparkman and her said children it being my will intent and meaning that neither the said Philip Stedman Sparkman or his Father or Mother nor the said Walter or Elizabeth shall have or take any benefit under this my will until he she or they shall do execute and perform all and every act and acts which on their his or her parts may be necessary for confirming the Sales aforesaid and carrying the Trusts of this my will into complete execution and I do direct my Trustees and the survivor of them and the executors or administrators of such survivor to receive the rents of my said Nashend Estate and Lands so devised to the said Philip Stedman Sparkman and the Rents of all other my Estates which shall not be sold and the interest of the monies of such as shall have been sold and after paying all interest of mortgages and other outgoings chargeable thereon or payable thereout and doing all needful repairs to the houses, buildings and premises and paying all fines and fees for renewals, admittances or otherwise and the Legacies aforesaid do and shall place the surplus monies out at Interest and form the same into an accumulating fund for the benefit of such other person or persons who shall lawfully be my heir at law and join my said Trustees or the survivor of them or the heirs of such Survivor in the Sale of my said Estates and in making and perfecting the titles of such as have been or shall be sold as aforesaid. And I do will and direct that my said Trustees by and out of the monies which may come to their hands to pay and reimburse himself all Costs Charges and expenses which they or he may sustain or be put unto in and about the Trusts hereby in them reposed nor shall one of them be answerable for the acts receipts or defaults of the other but each for his own act only nor for the insufficiency of any security or securities on which the said Trust monies may be placed they acting as they would do in their own concerns under like or similar circumstances and lastly I do declare that the receipt and receipts of my said Trustees or the Survivor of them or heirs, executors, administrators or assigns of such Survivor shall be good and effectual discharges for all monies mentioned in such receipt and receipts to be received and the purchaser or purchasers of all or any part of my said Real or personal Estate shall not be obliged to see to the application of such purchase monies and lastly, I do hereby make, nominate, constitute and appoint the said Richard Heming and James Holbrook, Trustees and Executors of this my will, hereby revoking all others by me at any time heretofore made. In witness whereof I, the said Testator Philip Stedman, have to this my last Will and Testament contained in two sheets of paper to the first whereof I have set my hand and to this last my hand and seal the thirtieth day of April One Thousand Eight Hundred and nineteen Philip Stedman Locus Sigilli [ = place of the seal] Signed, Sealed, Published and Declared by the said Testator, Philip Stedman, as and for his last Will and Testament in the presence of us who in his presence at his request and in the presence of each other have hereunto subscribed our names as witnesses. Richard Hendrick, Bosbury, Margaret Jackson, Servant to the said Philip Stedman Esq., James Gregg jr, Ledbury. Proved at London 17th April 1822 before the Judge by the oaths of Richard Heming and James Holbrook, the Executors, to whom administration was granted being first seen (by commission) duly to administer.